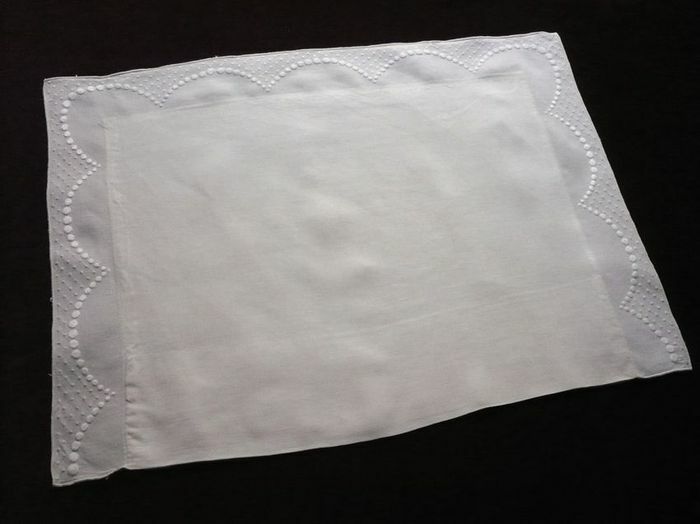 A sweet infant pillow sham in a lovely grade of eggshell white "fil de lin" linen. This sham is rectangular in shape and envelope style with a hand embroidered stylized border typical of the art deco motifs of the 1930's. A series of arching semi circles embroidered in polka dots frames the sham and tinier dots fill the rest of the border. Impeccable condition. Dimensions: interior 17 x 14in., exterior 21 x 16in.